Just as the Bull Shark can live in salt and fresh water, the Shark EVO One 2 can operate as a full face and open face helmet with a quick flip of the chin bar. Other modular helmets might as well be bottom feeders since most chin bars do not adapt to to your needs like the Shark EVO One 2. Most other modular helmets have a chin bar that flips up only to catch wind and throw off the balance of the helmet. The EVO One 2's chin bar flips all the way from front to back, keeping the weight of the helmet low and the chin bar out of wind gusts. The injected thermoplastic resin shell comes in 2 shell sizes for a more tailored fit compared to the previous Shark Evoline 3ST's single shell. 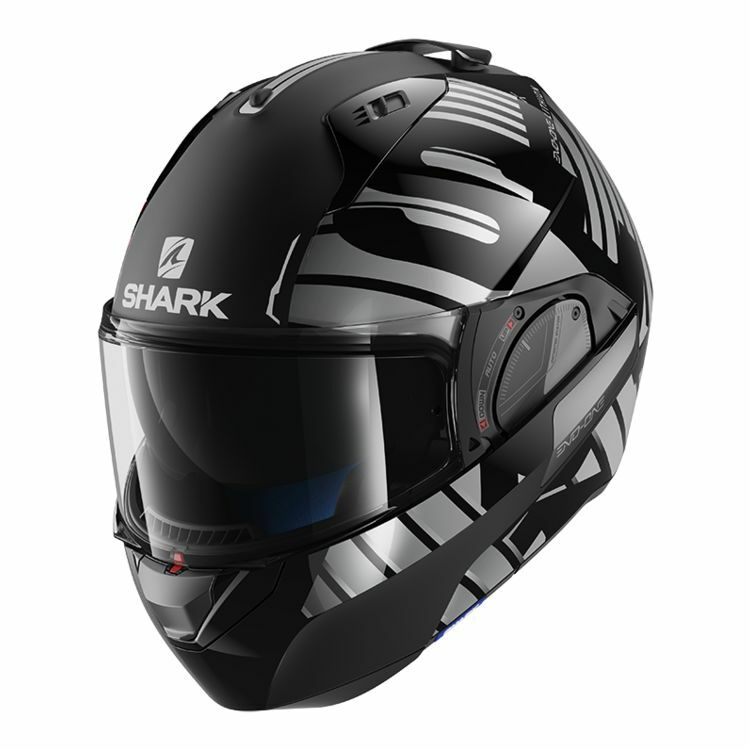 Shark EVO One 2 is the top of the food chain, an apex predator when it comes to modular helmets. Note: Not compatible with the Sharktooth or Sharktooth Prime Bluetooth system. Size 2XL may be marked as KS or KS-XL. bought this as i loved the shark explore i got from revzilla for fit and comfort and noise. but this one seems a bit cheap. today my first ride and flip back the chin bar and now its frozen in place. won't budge a bit. felt cheap in how it moves and too much plastic. so now its an open face unit which i dont want or need. this is the first helmet i didn't buy from Revzilla, picked it up in germany for a lot less like $320 but now i see why they know over there this a poor quality helmet, so unlike Shark past products. really disappointed so will have to continue with old monaco lazer also bought from revzilla like 4 years ago. I haven't used the helmet enough to give a full review. I bought it because it's a modular that doesn't have a giant sail on top of my head if I want it open. I've installed a Sena 20S headset with aftermarket speakers, iASUS XSound 3, which are much larger than the stock Sena speakers (but sound much better). The addition of speakers in the helmet is great with pockets built into the cheek pads. Comfy and easy to use. Seamless andloving it. Will the shark tooth communication fit this helmet? "Ready for installation of the SHARKTOOTH® (or other) Wireless Entertainment System." Can I install my sena 20 s on this helmet? BEST ANSWER: I have the harley version of the 20s..... you... can... but you'll have to cut out the ear pockets, and the unit doesnt sit flush with the bottom of the helmet rim, and need to push it back a ways on the helmet (otherwise the chinbar will hit the unit). I would say this is not ideal but it can be done. I wish this system would let me attach pictures, would be so much easier to explain. Helmet comes with very small speaker cut outs for some special comms unit (shark-tooth? I think they call it). Those have to be made bigger for the speakers that come with the 20s. It is not hard to do, just minor modification. I used an exacto-knife. Yes, I have this same setup on my helmet. 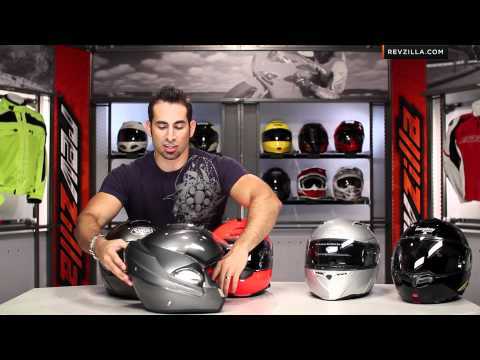 Will the Shark Evo One 2 be fitted on Head round like Shark Evoline 3? BEST ANSWER: The helmets are similar but they haves slight differences. Any everyone is different. Best way to know is to try them both. In my opinion they both have a more rounded head shape and the EVO one 2 has more comfortable padding. Why does the product summary page show 3 star rating but when I open the ratings link it's actually 4.3 stars? Can I get a heated shield with it?